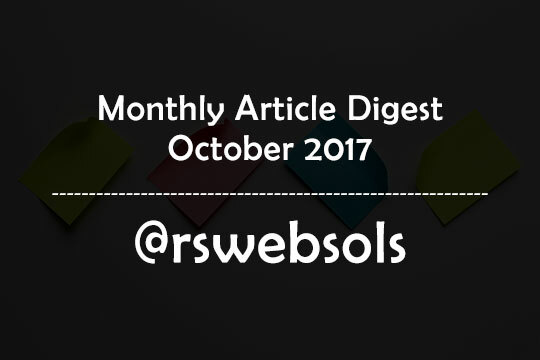 This is an article containing the monthly article digest of the month “October 2017” at RS Web Solutions (@rswebsols). You can easily find all our published articles of October 2017 in a ascending order by date. This is a monthly archive page to help our readers to give an easy-to-find list of monthly articles. Along with the article title, you can also able to read a short excerpt of each article. If you find an interesting article that catches your attention, you can, of course, click on the “continue reading” link to read the entire article. Happy reading! This is an article containing the monthly article digest of the month “September 2017” at RS Web Solutions (@rswebsols). You can easily find all our published articles of September 2017 in a ascending order by date. This is a monthly archive page to help our readers to give an easy-to-find list of monthly articles. Along with the article title, you can also able to read a short excerpt of each article. If you find an interesting article that catches your attention, you can, of course, click on the “continue reading” link to read the entire article. Happy reading! 13) How are New Technologies Improving the Creation of Animation Films? 17) The Happy Halloween Party Flash Sale on GearBest – Make the most out of it! 22) This is why SEO is so Famous for Small and Corporate Level Business! 27) Divi Vs. Avada – Which Premium WordPress Theme is the Best Choice? 31) What is Microsoft SQL Certification? Which is Right for You?